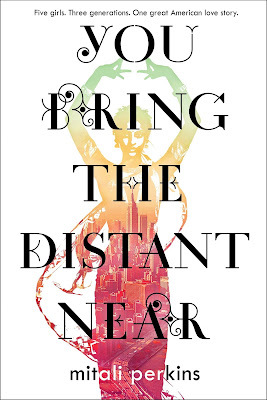 YOU BRING THE DISTANT NEAR (Macmillan | FSG) has received some exciting responses. Before it came out, EW picked it as one of the most anticipated young adult novels of the year. On release day, which is thrilling enough, I heard that it was nominated for the National Book Award! It also won a Walter Honor Award! I was thrilled, to say the least. The book received praise from Bustle and Teen Vogue, and SIX ★ starred reviews (Publishers Weekly, Horn Book, School Library Journal, Shelf Awareness, VOYA, and Booklist.) The New York Public Library, School Library Journal, Horn Book, and Publishers Weekly all featured it as one of the best books of the year. It's also one of the titles on the Best Fiction for Young Adults list and the Amelia Bloomer list of recommended feminist fiction literature, both curated by the American Library Association. Meanwhile, on the audiobook side, the beautifully-narrated version of the novel was an Audie Award finalist. Yay! Celebrate with me, friends. It's also available in a magnificent audio version, performed by five uber-talented actors.